Nashoba Girls Youth Lacrosse is teaming up with longtime lacrosse coach Rich Fulvi for four lacrosse clinics in September in Bolton. The clinics are open to all girls in grades K-8. Fulvi has 20 years of coaching experience and is currently the owner and head coach of Rewards School of Lacrosse, serving Central Mass, and has coached youth through college lacrosse for both men and women, according to NGL Co-President Christine Shaw. Most of the girls who participate in the clinics usually continue to play for NGL in the fall and/or spring. The program has indeed grown quite steadily since its inception. 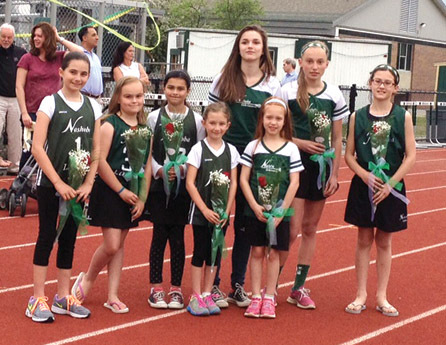 Initially started by Patty Bolton and run under the Nashoba Youth Lacrosse League umbrella, the girls program branched off into its own entity in 2009. According to Shaw, the program started with only older girls, but as it became more popular, it added younger teams as well. In fact, 82 girls signed up to play last spring, taking part on four different teams. With some difficulty in finding experienced coaches for the girls, the league reaches out to the older high school players to assist with the task. Shaw noted that high school students Abbie McCaffrey, Brittany Joseph, Olivia Hurd and Laurel Gumbart helped out with the youth program this past spring. These high schoolers add an additional coaching element in that they are current players. The team concept is taken even further, as players from U13 and U15 are encouraged to become junior helpers to U9 and U11 teams. Shaw noted Christina Lengieza, Chase Meininger and Courtney Cote were helpers last year and said that the younger girls really look up to older girls. “The youth players are also doing their part to support the high school team by attending the high school games, including senior night when our young girls presented flowers to the graduating senior players,” said Shaw. This past season, NGL, a member of Mass Bay Girls Lacrosse League, had a “great spring season,” according to Shaw, despite being a relatively new sport to the area. The season ended with a jamboree on Father’s Day weekend, which was a two-day event held in Byfield and Wrentham, MA. Teams can register to play one of the two days. In addition to the regular season play, Shaw said the Nashoba High girls varsity lacrosse team conducted a one-day clinic for the youth girls that they hope will become an annual event. For the next spring season, play begins in early March with indoor sessions on Sundays in Acton at Teamworks, according to Shaw. “We feel the indoor sessions are extremely important as it gives the girls time before the actual games begin to brush off the dust and polish up their skills,” Shaw said. She noted that sometimes players haven’t even picked up their lacrosse stick since the previous spring, so the indoor scrimmages are very useful. Outdoor practices are usually twice a week, with games on Sundays starting in April and ending with the jamboree in June. Registration for the spring begins approximately on October 15, 2014 and closes November 30. Returning players can register from Oct. 15- Oct. 31 and the general public can sign up from Nov. 1- Nov. 30. Sessions run on 4 consecutive Saturdays beginning September 6. U9 & U11 will run 3-4pm at a cost of $40 per player for all for weeks. U13 & U15 is scheduled 4-6pm and will cost $60 per player for all 4 weeks. All sessions will take place at the Horse Ring Field in Bolton. Visit www.nashobagirlslacrosse.org to register for clinics or to play or contact Christine Shaw at cls870@verizon.net for further information about NGL.